High performance, quick-setting two-component adhesive for fixing large ceramic and marble tiles. 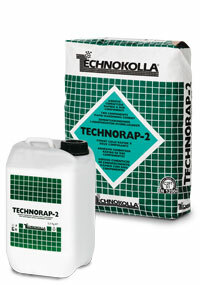 Suitable for over-tiling and on heating screeds. - Quick fixing ceramic tiles of all types, even large sizes, on indoor and outdoor walls and floors swimming pools or facades. - Quick-fixing stone materials, also those liable to staining and with a slight tendency to warping. - Suitable for use when high performances are required as the installation in industrial environments. CSTB certified product for laying on floors P4 and P4S. - Over-tiling on top of old ceramic tiles, also outdoors and without the use of primer. - Fixing composite marble with an average sensitivity to water, indoors*. - Spot-glueing insulating panels made of polystyrene, polyurethane foam, rock or glass wool and cork. * The outdoor installation of composite marbles must be assessed with the manufacturer of these materials. Cement-based plaster, cement-lime mortar, gypsum-based plaster¹, anhydrite screeds¹, cement-based screeds, concrete, aerated concrete, old ceramic floors, old linoleum floors², PVC² or vinyl², wooden panels, plasterboard, RASOLASTIK range and RASOGUM.